Early Humans Homo Erectus - HISTORY'S HISTORIESYou are history. We are the future. Review: What is a Hunter Gatherer? Homo erectus - "Upright Man"
These early humans of the stone age learned to make fire. They were hunter-gatherers. They traveled over land bridges from Africa and began to populate the world. The early humans known as Homo habilis were around for about 200,000 years. During that time, you might say early humans grew up. Even though Homo erectus had brains that were only about two-thirds the size of ours, they were otherwise about the same size as modern humans. Compared with Homo habilis, their tool-making skills were considerably improved. Their weapons now included stone axes and knives. Whereas Homo habilis scavenged for meat, Homo erectus was probably the first true hunter. Homo erectus was also the first early human to possess fire-making skills and, like all new, major inventions, this discovery changed life dramatically. Because the teeth and jaws of Homo erectus were shaped somewhat like ours are today, we could say that the Homo erectus species was the first to look like ... people. You might think this change in appearance happened over time as a result of mastering fire and learning to cook their food. According to Harvard anthropologist, Dr. John J. Shea, however, that’s not true at all. Dr. Shea told us: “The reduction of teeth and jaws due to cooking is a popular idea but, from an evolutionary perspective, is not plausible. If you relax selective pressure for massive jaws—say by cooking food—you get greater variety of jaw types, not reduced size or strength of the jaw." H. erectus had more advanced tool making skills. In fact, scientists now think a smaller jaw probably evolved due to changes in how these early humans breathed. As humans evolved, they had less body hair than their ancestors. As a result, the need to pant (the way dogs do) to cool themselves also gradually disappeared. Because of those changes, not only did the shape of their jaw change, eventually they also developed the ability to speak. Why was the ability to make fire so important to early humans? As early humans had already discovered, most animals were afraid of fire, so a roaring campfire gave protection to the group or tribe. With the use of fire, unless they chose to do so, they no longer had to shelter out of the wind. If their fire went out, they could re-light it. With the ability to control fire, they could choose where they camped. On a hot night, if they could find a relatively safe place, a breeze might feel good. Control of fire also made moving into colder regions possible, and that meant that these early humans could travel farther. Eventually, these early humans migrated out of Africa. Mastering fire also changed the way they prepared food. The ability to make and control fire gave h. erectus an advantage over other early human ancestors. People during this time period began to consistently cook their food. Food that is cooked is safer from disease and much softer to eat. As a result, it would have been easier for the young and the old to get the amount of calories needed to survive. The availability of meat and their ability to cook also increased the amount of protein in their diet, and that led to the development of larger brains. Thanks to their fire-making skills, a nightly campfire became a possibility and a routine. Whereas fire was once used for comfort and safety, it now also provided a social occasion. The ability to control fire now allowed people to collect around the fire each night to share stories of the day’s hunt and activities, to laugh, and to relax. The Ice Age: About one million years ago, these people began to slowly leave Africa and populate the world. They traveled to other continents. They did not need a boat. The Ice Age was here! For a very long time, the earth was frozen, creating giant "walkways." They traveled across these giant walkways, natural bridges of solid, frozen ice and land. These walkways allowed them to travel over what would later be vast rivers and seas. Some of these walkways were a hundred miles wide! These early people wandered from Africa to Europe and Asia, and from Asia to America, probably in search of food. How do we know so much about Homo erectus? At work unearthing Peking Man in the late 1920s. Like the discovery of Lucy, scientists found skeletal remains that testify to the differences between Homo erectus and previous early humans. The remains also point to the increased mobility and range of this early human ancestor. During exploration on the isle of Java in Indonesia, Dutch paleoanthropologist Eugene Dubois discovered the first evidence of Homo erectus in 1891. He named his find "Java Man." In the late 1920s, scientists working in caves outside of Beijing, China found several skeletons that date to the period of Homo erectus. These skeletons are referred to as "Peking Man." Peking was the name of Beijing at that time. Artifacts that include their tools and weapons have also been found. Those artifacts help us to understand how they lived, where they went, and how they got there. 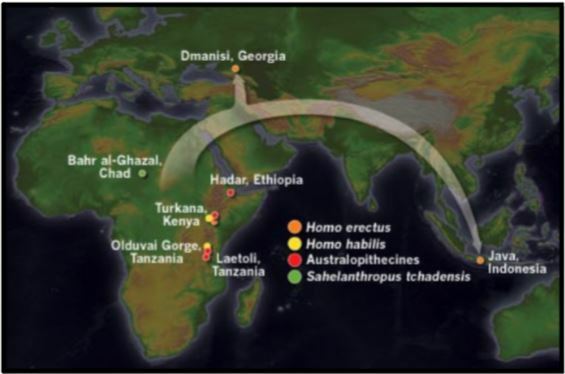 This map shows the migration patterns of early humans out of Africa. Activity: To complete this lesson, please fill out the fourth row of the Early Humans Comparison Chart you began in the first lesson of the Early Humans study unit.